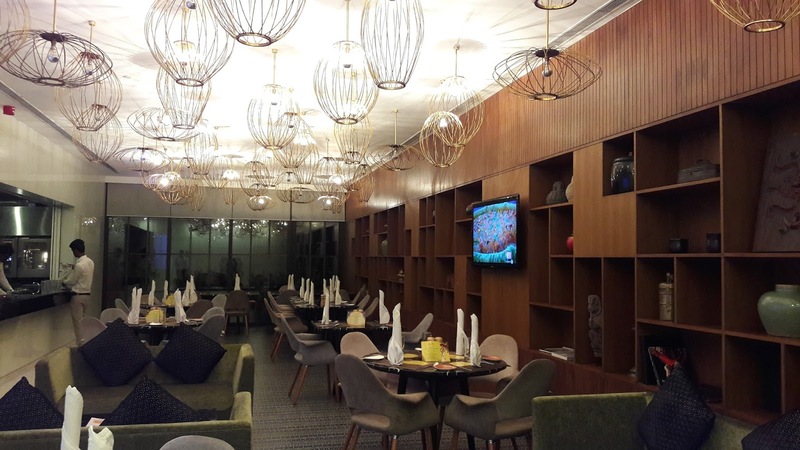 Phoenix MarketCity at Velachery has a little secret tucked away inside the mall - a hotel! Design Hotel by jüSta is a 4 star luxury boutique hotel with 26 rooms. I know a lot of folks who are surprised when they learn of the presence of a hotel in the mall. 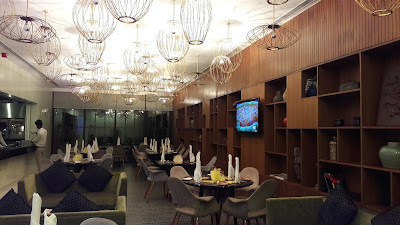 Annam Cafe is the restaurant located within the hotel. It was my third visit there and what I like about it is that it is a quiet space, a great place to meet up with someone for coffee or a meal rather than in one of the restaurants in the mall. A group of us had been invited to review the ongoing "Chettinad festival with the King of Fruit". King of fruit - that has to be mango, right? So mango and Chettinad food. What's the connection? We're almost at the end of the mango season but Cafe Annam still had a few aces up its sleeve. 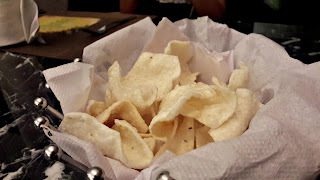 To answer my question, Chef Suresh plonked a small bowl filled with some brown stuff in front of me - ripe mango pulp, a blend of spices, tamarind and jaggery. Sweet, tangy, yummy. He tells us he will be serving some of it with our meal. We got mango juice to sip on. It wasn't just mango juice, something else added to the acidity. There were brown flecks floating in my drink and that's when the chef let on that it was lime pickle skin. Of course! 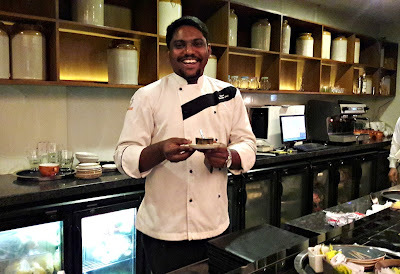 Chettinad is famous for its pickles and the line of pickle jars decorating the open kitchen should have given me the hint. It is an apt pairing. 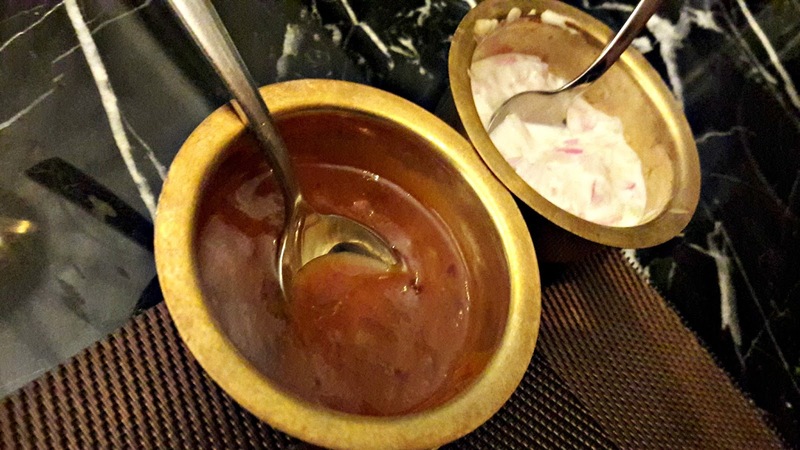 Chettinad spiced kozhi varuval has cubes of tender chicken tossed in home ground spices. Typical aromatic Chettinad spices like fennel, chillies and coriander could be identified but there was one other that intruded into it all - that of tomatoes and it stood out like a sore thumb. The broccoli and cauliflower peratal was mildly spiced and I would have liked it more if it had been cooked a little less. Both starters came with a stack of cheese and yoghurt coated onion rings. That was a nice touch. Flaky parathas were served with chicken and mutton Chettinad. Both gravies tasted the same; I preferred the one with mutton. The main course was served in brass thalis. 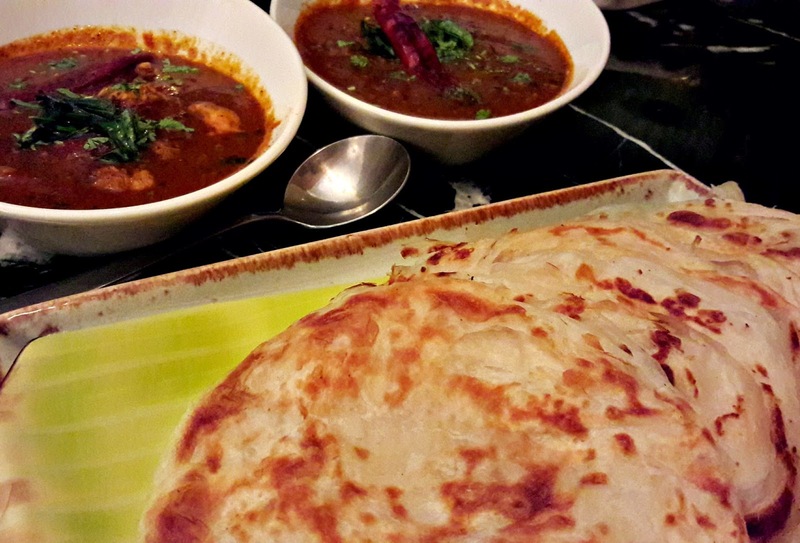 Some heavy thumping was going on in the background and the reason was soon served to us - kothu parathas. Once again, they tasted quite similar except for the protein. 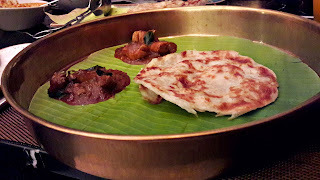 The perfect accompaniment was Chef Suresh's ripe mango chutney that toned down the spice levels in the kothu paratha and added a lovely touch of sweetness. The ghee rice was aromatic and an absolutely no-frills dish. Long grained rice had been cooked to perfection with just the right amount of whole spices and garnished with fried onions - simple flavours and presentation that showed restraint. Nadar-style mutton korma had well cooked cubes of mutton, thickened with ground coconut and seasoned with an aromatic mix of spices. A counter separates the kitchen from the dining area and we all stood there watching the chef plate the desserts on large slate tiles. He scraped a blob of mango puree across the centre, added a line of chocolate soil and then arranged chopped mango and blueberry compote in the spaces. 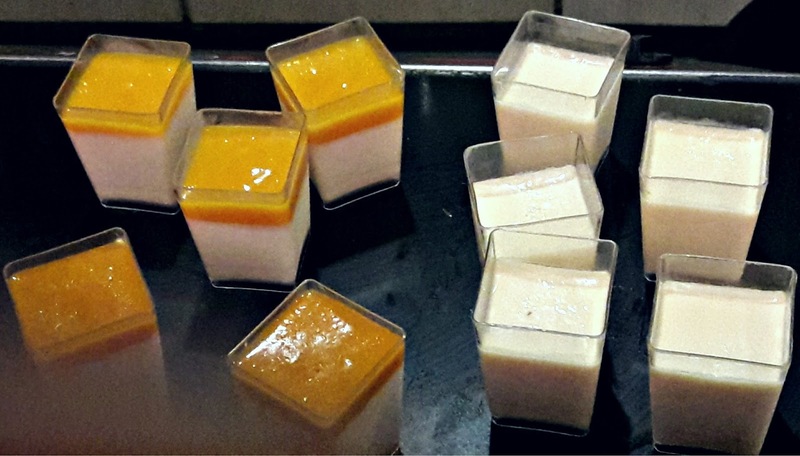 On one, he placed pannacotta triangles and on the other, quenelles of baked yoghurt and finished both plates with edible mango-yellow marigold flowers. The baked yoghurt was fabulous. Chef Suresh's Chettinad and mango flavours did throw up some surprises. In the hands of a competent chef, magic can happen. 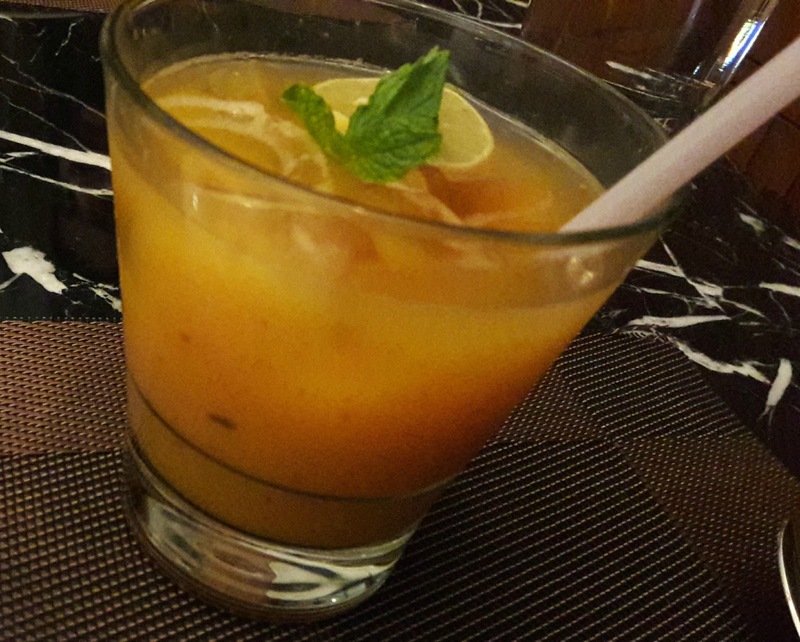 The Journey of Chettinad with the King of Fruits is on till June 25th. The timings for the special menu are from 1 - 3 pm and from 7 - 10 pm.